Amish have long lived in Canada, with roots in the country dating to the 1800s. Today Amish number nearly 5,000 in Canada, in over one dozen communities. For many years, Ontario was the only province in Canada where Amish could be found. Recently, small settlements have been established in New Brunswick, Prince Edward Island, and Manitoba. Canada experienced a significant influx of Amish post-World War II, with Amish migrants seeking to avoid military conscription or the alternate service programs which arose in place of military service. GAMEO notes that “Later Canadian restrictions have, however, caused some Amish to return to the United States. This has caused most Ontario Amish settlements to remain at one to two church districts (congregations)” (see GAMEO: Milverton, Ontario, Old Order Amish Settlement). Today, the Amish population in Canada stands at nearly 5,000. The Canadian Amish population ranks 11th among all states and provinces, between Illinois (10th) and Minnesota (12th) (see Amish Studies web site and Amish Settlements Across America for further population statistics). Canada’s largest Amish settlement is found in Perth County, near the communities of Milverton and Millbank. The Milverton Amish settlement was founded in 1824 and is the oldest in Canada, with 9 church districts as of 2011 (Raber’s Almanac 2011). The Milverton community also includes mailing addresses for nearby Millbank, Newton, Linwood, and Atwood. 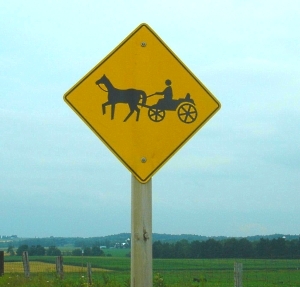 The Milverton Amish are considered to hold to older dress and buggy-style traditions, and use buggies without tops. Contact between the older Milverton Amish and the newer Canadian Amish groups has been described as “minimal” (GAMEO). An indication of different origins are the family names found in this settlement. Among others, the last names Kuepfer, Albrecht, Jantzi, and Streicher are seen in the Milverton settlement, but are rare elsewhere across Amish North America (the settlement at Kincardine in Bruce County, ON being an exception). Since the mid-1990s, the Milverton settlement has held an Amish School Auction, open to the public and including items such as furniture, tools, animals and food. The 2012 edition drew an estimated 10,000 people. As in other communities, proceeds from the auction are a primary source of funding for area Amish schools. Founded in 1953, Aylmer is currently the second-oldest Amish settlement in Canada, and is comprised of 3 church districts. Aylmer is a small settlement, but well-known throughout Amish society. This is due to the presence in the community of 2 Amish institutions: Pathway Publishers and the Heritage Historical Library. Pathway Publishers was founded in 1964 as a publisher of books and monthly publications (see GAMEO, Pathway Publishers). Today Pathway publishes 3 monthly periodicals: Blackboard Bulletin, a journal for teachers, Young Companion, aimed at an adolescent audience, and the flagship Family Life, a general interest publication for the entire family. Pathway publications have circulations in the tens of thousands. Pathway also publishes pamphlets, and textbooks used in Amish schools. The Heritage Historical Library in the Aylmer settlement is a repository of books and historical documents relating to Amish and Anabaptist history. The library is curated by Amish historian David Luthy, and serves as a valuable resource for researchers and historians. The Lucknow Amish settlement in Bruce County was founded in 1973. Today it numbers 5 church districts, and is the second largest Amish community in Canada. Oxford County has the most individual Amish settlements in Canada, with 3 separate communities as of 2011. The oldest and largest is found near the town of Norwich (founded 1954, 4 church districts). The Lakeside community was started in 1958, and numbers a single church district. The Mossley/Mt. 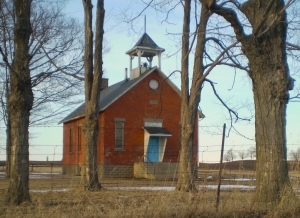 Elgin area is home to 2 Amish congregations. Besides those mentioned above, Ontario was home to 9 more Amish settlements as of 2011 (see Amish Studies). At least one Swartzentruber Amish settlement is found in Ontario, in Grey County near the town of Chesley. At over a half-century in existence, this community is one of Canada’s oldest, and consists of 3 church districts. A second Amish community, (not a Swartzentruber group), is also found near Chesley (1 church district). Many Old Order Mennonites also live in Ontario, numbering close to 4,000 individuals in over 40 congregations in the province. Old Order Mennonites, or “Team” Mennonites as they are also known, share some similarities with Amish. With mutual Anabaptist roots, Mennonites and Amish both maintain principles of non-resistance, non-conformity, plain dress, Pennsylvania German language, horse-and-buggy travel, and a general reluctance to accept advanced technology. Old Order Mennonites differ in their particular style of dress, place of worship (meetinghouses rather than in-home worship as in the case of Amish) and use of technology (some Old Order Mennonites permit electricity and phones in the home, and make greater use of tractors). Old Order Mennonite settlments in Ontario can be found in the vicinity of Kitchener, Waterloo, Elmira, St. Jacobs, Aylmer, and other communities. Canada is the only location outside of the United States where Amish are found. Though Canada once attracted Amish from the US, in recent years Ontario has seen a slight net 0ut-migration of Amish (see Amish Studies, “Amish Household Migration 2006-2010”). Ontario is home to a number of well-established settlements, however, and with the twin institutions of Pathway Publishers and the Heritage Historical Library, the province remains an important area of Amish settlement. Yoder, Samuel L. “Milverton, Ontario, Old Order Amish Settlement.” Global Anabaptist Mennonite Encyclopedia Online. 1989. Web. 17 November 2011.http://www.gameo.org/encyclopedia/contents/M558ME.html. Yoder, Samuel L. “Pathway Publishers.” Global Anabaptist Mennonite Encyclopedia Online. 1990. Web. 17 November 2011. http://www.gameo.org/encyclopedia/contents/P384ME.html. My wife and I are leaders of a Christian Church in the UK. We would like to enquire whether it is possible to stay/work with a family for 7 to 10 days in the Kitchener area, as we hope to come over this summer and also visit relatives in Niagra on the Lake. We have long had an interest in the communities and their life-style, and would like to experience it first hand, and exhange information about our Christian experience and life. If you could give an indication as to how we could go about this we would be most grateful. I lived in Aylmer and worked at Pathway Publishers from 1977-1990. We visited the Pathway publishers many years ago (when I was still Mennonite) and was really intrigued with the publishing. I no longer am Mennonite but would like to subscribe to them again. No mention made of the ever growing number of Amish-Mennonite in the Dunsford/Lindsay/Cameron/Glenarm/Fenelon Falls area of Ontario. I have found 3 schools thus far and 3 established produce and baked good vendors from May-Dec. I have found a good 30 Amish farms in this area as well as a Furniture Maker, Harness Repair Shop, In-home Quilt Shops, Wooden Lawn Furniture Shop…. I didn’t know the Lindsay Amish settlement is that big. I visited there about 5-6 years ago. I am looking for a hand quality wood shed with an area where we can dine with railing and a roof with windows and a door to accommodate my lawn tractor and garden equipment- Amish preferred craftsmanship. I used to live in Waterloo and appreciate their quality but I am flexible. I live in Bethany, ON, area and looking for appromiately 10x 10 or 10×12 size. Please get back to me with approx. quote- thank you. I’m to understand there are a group of Amish workers in the Lyndsay area that can be contracted for building purposes? If someone has further information with respect how I can in touch with these gentleman I would very appreciated. I saw through the site there are builders available that build sheds/bunkies etc. Never the less if anyone has information for me it would greatly appreciated. I know I do not have to worry about the structure once it is completed by these gentleman. I know that on Glenarm Rd at the Birchpoint Rd intersection there is Zehrs Mart and they have some beautiful sheds that are all Amish made. It is on Glenarm btwn Birchpoint Rd & Killarney Bay Rd. I am good friends with that entire community and they are truly a wonderful group of Amish. They only have a couple phones in the community, I have each of those numbers should you be interested. As well there is a Mennonite run business, not sure of the name in Lindsay on King’s Wharf that make bunkies. I can get that info if you want. I highly recommend Zehrs, they have numerous on site for you to see. Contact me is you want. Actually you do not need electricity to power a phone! The Mennonites that have businesses have phones and in the Amish community there are phones at the school houses and a couple businesses……so the Amish DO have phones! Not funny Johanna, grow up and learn something by reading or visiting these communities. Can’t you respect what people are living. I am not Amish but I do respect their way and admire that they are close to the land and more particularly their community. In the Milverton Amish community, their Elders and Bishops have amended their Ordnung and have decided to allow phones for those folks who have businesses. The phones have to be in a little shed ( unheated) at a certain distance from the house…50 feet or thereabouts. The phone takes messages only. In order to return calls, they may have a cellphone in the keeping of a non Amish (akaEnglish) employee who then returns the calls. Likewise, the business vehicle…my friend’s father runs a carpentry businness and has a phone as well as a van, which is not driven by him, but by an employee. Most Amish do not welcome outsiders or non Amish into their homes or communities as they feel it may weaken their community unity. Cheryl, I have a phone contact number for Lindsay, but don’t really want to post in on a public forum. If you email me at myoder@amheritagecenter.com I will send the phone info directly to you and they should be able to put you in contact with the furniture maker in Lindsay. would you happen to know Amish farm close to Hamilton Niagara area in Ontario? I am looking for natural cheese to add to a special diet required for my current medical condition. I have a ton of pictures from the area. I should get them all up on my blog for you to see Katie! The area keeps growing! I am always shocked to see how many places there are! When I randomly stopped to a group of kids walking home when I asked home many were in there school the young lad told me there was 30 some kids. Come up for a visit and I will take you on a tour over that way Katie! I would love to make a trip up there again. I am about a year late, but wondering if you could provide me any specifics as to where to find Amish shops or farms in the Glenarm/Linsday area? I know much will be closed until summer but was hoping to take a bit of a road trip up around that area and would love to see some Amish culture. Thanks! Sorry so tardy with the reply, I totally missed this. Glenarm Rd is a good start point. Mainly between Birchpoint and Mark Rds. You just need to travel the back roads and you will see it all. On Killarney Bay Rd there is a Quilt and Notions shop. If you make it to any of these places tell them Allyson sent you! In a previous blog’s comments, Erik, someone mentioned making puzzles from your pictures. There are two pictures in this blog, the yellow house and the red schoolhouse, that would definitely get my vote. I’d love to stare at that yellow home for hours; it is so beautiful and serene-looking. Hi there. I actually took the two photos you are referring too. FYI, the house is not yellow but actually white. The reason it looks a bit “cream” in colour was because it was at sunset, so there was a warm glow from the sun on the white of the house. I just discovered this great site! I live in “mennonite/amish ville” apparently… I work in Kitchener but in order to get to my home i have to pass through a lots of the above areas… Millbank is the most mennonite/amish populated area for sure. They have a “Zehr’s” country market… It has the BEST fruit during the summer…It’s a small country store and there is the Millbank cheese factory as well… Milverton has the best bakery! fresh bread and some pastry at around noon time daily. Lucknow is another area that i spend my weekend at… there is a butcher shop…and the bakery as well… the ladies that run it are mennonite for sure! outside of Lucknow there is a large population of mennonites! BUT they are moving further up north! especially the “younglins” who can’t afford to purchase the big properties and land that their fathers were able to afford. outside of Lucknow there is a large population of AMISH! BUT they are moving further up north! I grew up in Milverton. My stepfather was Reformed Mennonite. This past spring we went home for a visit…and made stops at the St Jacobs market where I bought homemade summer sausage and rye bread…stopped for lunch at Anna Maes in Millbank where we also bought cheese from the factory…then on to Milverton for the bakery and their coffee cake. There used to be an excellent bakery in Baden too that made the best strudel! And naturally, I came home with maple syrup fresh that spring. Sometimes I miss the slower lifesyle, but I dont miss the strictness…at all. Because my Mom would not convert, my stepdad, who was a minister, left the church. It must have been very difficult for him. I was wondering what the lifestyle of the Canadian old order Amish is like. There is so much known about the American Amish, but I would like to know more about the Canadian Amish. Are the men required to wear beards and a certain hairstyle? Are they open to outsiders, especially those interested in joining the religion? Whatever info is available, I would like to receive it. try to join that community if you can.. but remember Amish lifestyle never brought Salvation to anybody and never will. while you are there try to find out what the reason is that so many young people leave the Amish there, and you might be find it very interesting that most of David Luthi’s children have followed their fathers example. have NOT followed their fathers example. Have you ever heard of the Orthodox Mennonites that are found in Ontario? Mark Burr has some really great photos of this group on his Flickr account…that is where I originally learned that there was such a thing. Usually, one can tell an Old Order Mennonite from the Amish by dress alone…but the Orthodox Mennonites are VERY similar looking to the Amish in clothing style. I have read many books on the Amish, but can not find what I am looking for. I have visited Milverton, ON, and was somewhat surprised by the open carriages. Although I have since read about them and this tradition, I still don’t know why. And, particularly, where did these Amish come from? Are they Swiss Amish? What affiliation are they? Or are they an affiliation unto themselves? Why the open carriages? Also, where and when is the auction? I’d love to go. Interesting question about Canada’s oldest community Lee Ann. According to the affiliation listing in the book The Amish (p. 139), Milverton and its related settlements do comprise their own affiliation (comprising 12 church districts spread across 4 settlements). Though they have the open buggies in common this is not considered a Swiss group but a distinct Amish group which was settled directly in Canada by Amish from Europe (rather than American Amish settling in Canada as happened post-WWII). The other communities associated with Milverton are at Chesley, Clifford, and Tiverton/Bervie/Kincardine. Thanks, Eric! Your response was really helpful and cleared up a lot of confusion for me. I appreciate it! I hope to go back to Milverton this summer. What a great community site! I am a quilter from the West Coast and am looking for a Canadian Amish or Mennonite group of ladies to hand-quilt a large quilt I have hand-pieced. I do most of my quilting and piecing by machine, but this one(and another of similar size on the way) is completely pieced by hand. It would be great if I could employ a Canadian group, rather than send my treasure out of the country. Amy Amish Communities near Ottawa, ON, Canada? Closer than Kitchener,(St. Jacobs). Thanks. Thank you for sending me that web-site. I will definitely check it out. I have been to St. Jacobs’ a few time but it is quite far from Ottawa. I hope I will find something closer than an 8 hour drive as I would love to buy crafts from the Amish community. Belleville/Marmora is about 2.5hrs from you and they have a great little store on Hwy 62. Ontario Amish near to Ottawa. There is a settlement in Marmora/Belleville, Ontario based on Hwy#62. There is a community in Powassan and I have had some Ohio Amish telling me of a new community North of Thunder Bay! I laughed and explained what is North of Thinder Bay! Thank you for the information but Thunder Bay is even further than St. Jacobs. Amish closer to Ottawa, Suzanne. This is somewhat late but there is a settlement in Belleville on Hwy 62 btwn Belleville heading north to Madoc. I have also heard that they were looking to settle in the Ottawa Valley not sure if it ever occurred though. Hope you already found some closer than St Jacob’s but if not here you go! I was just wondering if there are any Amish or old order Mennonites in Nova Scotia? As for Old Order Mennonites, I don’t *think* so, but I don’t keep up with the OOM as I do the Amish, so you might want to look further into that. I do believe there are Kleine Gemeinde there: http://gameo.org/index.php?title=Evangelical_Mennonite_Conference_(Kleine_Gemeinde) May be other non-Old Order conservative Mennonites there as well. I am interested in knowing whether there are any Ontario, Canada Amish carpenters / craftsmen who build small cabins and sheds, and how I can get in touch with them. Send me a direct email and I would be glad to provide you with the details of how to get in touch with builders here in Ontario. Several recent articles from Canada caught my attention. “On July 11, 2015, the Amish community in Chisholm [Ontario] [near Powassan] got together and put on the breakfast of the year for the Almaguin region. With homemade pancakes, cinnamon rolls, donuts and scrambled eggs, event goers left with their stomachs full and their appetites satisfied. Although the event is a great social gathering, it serves a bigger purpose. It was their 7th annual pancake breakfast and bake sale. “On my last visit to the area, I actually took a “St. Jacobs Horse Drawn Tour” that took me on some rather tranquil country roads from the Farmers’ Market to a Mennonite mixed farming operation, with its apple orchard, maple sugar bush, livestock, corn crib, bank barn, quilt shop, and buggy shed. I next drove to the nearby village of Wallenstein, where I stopped at the Old Order Mennonite General Store, where their shoes, hats, and clothes can be purchased, along with a great diversity of other products, including foods, household goods, farm tools, and nails. It’s very much a “general” store. And while in this fascinating village, I also checked out the nearby Old Order Mennonite Harness Shop and the Wallenstein Feed Mill (the largest producer of feed in all of Canada). Several audio documentaries, including Alvin Yoder near Powassan. I am sorry to hear about youhaving been excommunicated…it must be very difficult for you. I know it was for my stepdad. Lifestyle really depends on what sect you are talking about…but there are broad stroke similarities…for instance, every action is offered up to God. Most old order Amish ( horse and buggy folk) are rural farmers, but many among them also have trades such as harness makers, buggy makers, farriers, cabinetmakers, finishing carpenters, furniture makers and so on. Amish dont have meeting houses or churches but take turns hosting Sunday services, which start early in the morning after milking and chores and go until the evening. Some hold their meetings in their homes (house Amish) while others hold them in the barn( barn Amish) . In both cases the community have a special enclosed buggy which transports the necessary benches needed for the service. 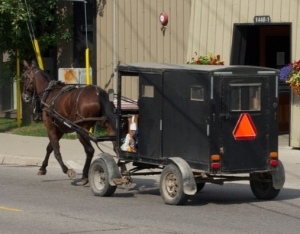 Mant Amish in the Milverton area use retired racehorses for their Sunday carriage horse. Its a sight to see the trotters and pacers, all strung out in a line with everyone going to meeting. Also…Amish buggy wheels are wooden and metal…old order mennonites often have rubber tires. Each community’s Elders and Bishops decide how the settlement will be governed and wht kind of things ( like telephones) will be allowed nd under what conditions. They also determine style of garments, hairstyles, hats for men, headcoverings for women etc. This is also how to identify one group from another. For instance, in some areas of Ohio, red can be used in quilts and garments. Among the Milverton Amish, you will never see red. It is considered a proud colour, a worldly colour. Swartzentruber Amish men only wear suspenders with one strap…most others wear two suspenders. The Swartzentruber Amish men also wear very lowcut pants compared to other sects. Amish men never cut their beards and dont have moustaches. They get up with the sun and go to bed with the sun in many cases. Reading is mostly limited to spiritual publications and Amish periodicals. They do not have electricity so no radio, tv, pc etc. Some use gas generators to power freezers or refrigerators, but many use old fashioned ice boxes and cold rooms for food storage. They are very hard workers, and their day is filled with physical labour. While the men are in the barn or fields, the ladies sew, cook, clean, can food, pickle food, tend the large garden etc. Most quilting is a group activity. That way it doesnt take long to do the handquilting once it is pieced together and in its layers. Fabricwise, Amish in the Milverton area wear plain clothes…no patterned fabric. But I see that some quilters are using patterned fabric for English quilts …quilts for outsiders, either commissioned or made for resale. This past summer I found a bakery/cafe shop in Berwick, Nova Scotia run by a family who are old order Mennonites. There is a small settlement in the area. It was a beautiful little shop. It was such a wonderful, peaceful spot. This spring, some Amish families will be moving from Ontario to Prince Edward Island, Canada’s smallest province. We welcome them with open arms! During my honeymoon to Belize, we were told that there was an Amish settlement in that country too. As well as a fairly large old order Mennonite population. This article impies Canada has the only non American Amish population just some food for thought. I lived in milverton for a few years and have a very Amish surname (spelling variant) and have always been interested in their culture. I’m wondering if they were not referring to the Mennonite settlement at Barton’s Creek? The one group there is extremely conservative and though I have only seen a few photos of that area, I thought the very conservative Mennonites looked more like the Amish. If there is an Amish community in Belize, I have never heard of it. Interesting to see the variant in your name. 🙂 Though there are some Amish who spell the last name as you do, most spell in Kuepfer. I am not sure, I remember them specifically mentioning Amish, but maybe they were calling the concertative Mennonites Amish. I just thought I would mention it. My ancestors were Kuepfers from Switzerland, but somewhere along the line some of them anglicized their name to the Kipfer spelling. You would be interested in knowing that your Swiss Amish name has not been anglicized. That’s a common misconception. Both Kipfer and Kuepfer are not uncommon spellings in the Emmental Region of Switzerland, and over time have sometimes shown up differently within a single family’s records. Most Kuepfers around Milverton/Millbank etc. in Ontario actually descend from a Kipfer family that had twin brothers who migrated at slightly different times to what became Waterloo County, pioneering near St. Agatha. They came to Upper Canada directly from the French-speaking part of the Jura Region (Le Locle, La Chaux-de-Fonds) of Switzerland but had maintained family records back in Sumiswald in the Emmental. Families had moved to more back-woods/mountainous areas due to persecution. In certain parts of Ontario a local clerk will ask a person “so are you an “i” or a “ue”? Everybody is related to some degree. Check out the cool EzraEby.com genealogy site if you don’t believe it! Most other Ontario Amish came from Alsace and southwestern Germany. Milverton and Millbank are not the original pioneer Amish settlements as those were originally settled mostly by people from Great Britain. The Amish expanded into those areas from their own pioneer settlements, especially in Waterloo County but also parts of Perth and Oxford closer to New Hamburg/Tavistock. The Milverton area has the most Amish families now because of an old split where they became Old Order and their relatives in areas like New Hamburg, Tavistock, and Wellesley areas “modernized” en masse. Land prices are extremely high in Perth County, the driving factor in movement to places like Bruce County, other parts of Ontario, or PEI, where you can buy four 100 acre farms for the price of one by Milverton. Relative newcomers are still called “American Amish” by Ontario folks. David Luthy is a great guy – joined the Amish after having earned a post-secondary education. My brother would like to donate fabric (our mother was a dressmaker) to quilters either near Aylmer or St Mary’s as he lives in London. How may I identify anyone interested in receiving this material? Elizabeth, try calling the people at “Suppertime Stoves” northeast of Aylmer. I know they have been involved with making comforters to send to Romania and other sewing projects for good causes. The phone number I have is 519-773-9569. If you are unable to make contact or find someone willing, Erik can put you in touch with me and I will help you find someone in either community. Elizabeth, Erik runs the website we are on, but is not connected to the Aylmer Amish community at all. I called the number now to see what names are mentioned. It might be best to try Suppertimes Stoves (the Mark Stoll family) at 519-765-2316 and because they are Old Order, it will almost certainly go to an answering machine unless someone happens to be there. Simply tell them what you want and leave a contact name & number. I hope this helps! I live in woodstock New Brunswick Canada and there is a old order Amish community here and also one in Perth Andover New Brunswick so there not all in Ontario. I will be travelling to Canada from Australia in October /November and would love to be able to visit an Amish settlement if possible. My transport is limited however and understand that Belleville (where I also will be) has one nearby. Could someone be kind enough to let me know any companies that go to or nearby the area where they are.Thank you for any help you can give me. please let put in contact with some Amish folk in the Edmonton and area – I would like to buy some of their goods. David there are no Old Order Amish in Edmonton or anywhere in Alberta. The nearest are in northwestern Montana. There are many colonies of a related Anabaptist group called Hutterites in Alberta, however. Maybe this is who you are referring to. There is a new community starting in Manitoba. I understand the first few families have either just moved there from Mt. Elgin, ON, or will soon be moving. Really goood info can be found on web blog. I understand there are several new Amish or Mennonite settlements on Manitoulin Island. Would like to have some carpentry work done. How can I contact them? Are there any Amish/Mennonite communities in Quebec?